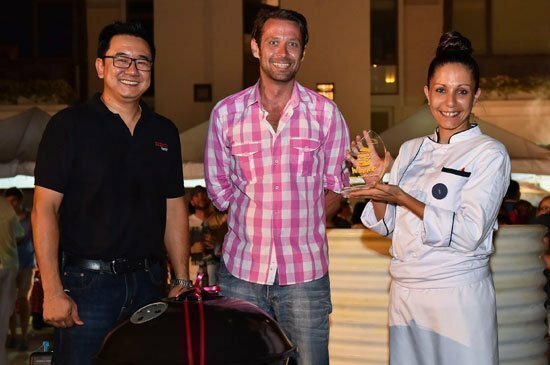 From left: Khun Krit Phetwarun, BBQ Shop; Jay Leshark, organiser of Burgerfest 2016 Phuket’s Best Burger; and Ms. Laia Pons, Head Chef of Kata Rocks and winner of “Phuket’s Best Burger” 2016. PHUKET, Thailand – The temperature was high at Phuket’s recent Burgerfest (Saturday 19th March) as 16 of Phuket’s best restaurants, hotels and resorts battled away to find out who has Phuket’s Best Burger. An annual event now in its second year, the Burgerfest was again held at Royal Phuket Marina where approximately 800 – 1,000 people feasted on the grilled fare and discussions about bun to meat ratio were interspersed with cold beer and wine as the anticipation built. A small group of food experts and burger lovers gathered behind closed doors to blind-taste 16 of the island’s best patties and buns (and so much more) as they ate their way through a challenging feast. After almost one hour of eating, judging and re-judging, the results were in. 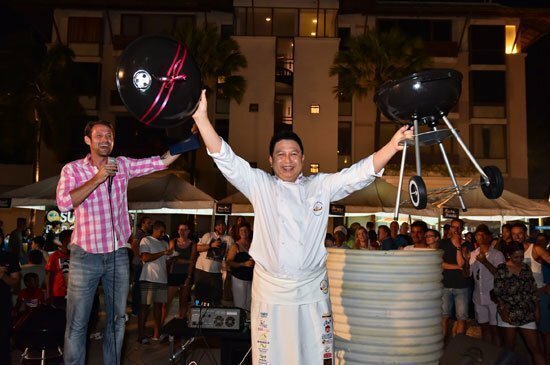 The winners were announced in front of a packed Town Square at the marina and the winner and home of “Phuket’s Best Burger” 2016 was Kata Rocks who went home with the island’s burger bragging rights, the shiny perennial trophy, a wall-mounted certificate and a brand-new BBQ from BBQ Shop. Second place went to The Frying Kiwi with third to XANA Beach Club, last year’s inaugural winner. Introduced this year was a special “Phuket’s Best Looking Burger” category, which was voted on looks alone and exclusively by the Phuket media corps. Judging the same 16 burgers, the Phuket media announced JW Marriott Phuket Resort & Spa as the winner of the 2016 “Phuket’s Best Looking Burger”. From left: Jay Leshark, organiser of Burgerfest 2016 Phuket’s Best Burger; Chakapong Masoo, Executive Pastry Chef, JW Marriott Phuket Resort & Spa and winner of “Phuket’s Best Looking Burger” 2016. A celebration of everything burger, organisers confirmed the 2017 Burgerfest will be even bigger and better. Watch this space!